A search of Tony Adams’ residence yielded a few clues, but not the .32 caliber murder weapon. While the search for Tony Adams, suspected of the kidnapping and murder of CHP Officer Steve Sodel continued, detectives dug into the background of the wanted man. Adams had served time in New York for grand larceny and he had been AWOL from Camp Rucker, Alabama, since May 1944. He was obviously a crook, but was he a killer? Based on the forensic science evidence there wasn’t much doubt that Adams had pulled the trigger of the gun that ended Patrolman Sodel’s life. A bullet removed from the dead officer’s body was a match for a slug found in the abandoned, bloodstained sedan discovered near Las Vegas. Tire impressions taken at the location where Sodel’s patrol car was found corresponded to tire tracks found at the place where his body was hastily buried. The most damning evidence against Adams was verified by the Sheriff’s Department—they said fingerprints taken from the left door of the impounded death car belonged to wanted ex-con and Army deserter. Twelve days after the murder there were several reported sightings of the fugitive in LA. 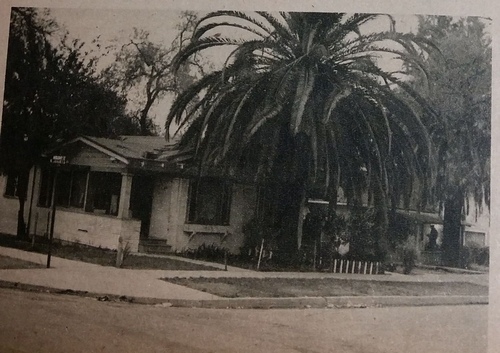 Cops thought that Adams had fled the state, but someone answering his description was seen one or two blocks from the West Los Angeles Police Station. None of the leads panned out. If Adams was in LA he was proving impossible to find. 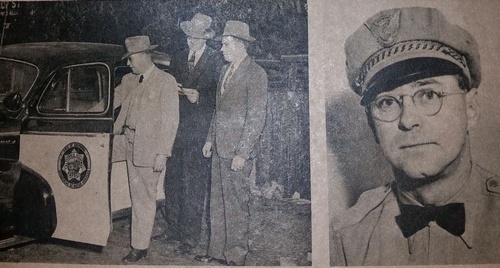 In the photo on the left, Detective Marty Wynn (left, who would later become a technical advisor for the TV show, DRAGNET, is show with Inspectors Mark Benson (center) and William Yonkin (right) examining Patrol Sodel’s official car. On the right is a photo of fallen officer Steve W. Sodel. Within a week of the LA sightings of Adams he was busted in New York City. He may have been running home to his mother, Josephine, a resident of the city. In a bone-headed attempt to evade capture the fugitive jumped from a two-story window and injured himself. Tony Adams, flanked by an FBI agent and a NYC detective, limps to a waiting patrol car. He was in a wheel chair when he appeared before a U.S. Commissioner in New York on October 8. Adams denied everything. Accompanied by Captain Gordon Bowers, head of the Sheriff’s bureau of investigation and Inspector Mark Benson of the California Highway Patrol, Adams was returned to LA to stand trial. Adams was also suspected of the June 5, 1946 slaying of CHP Officer Loren Cornwell Roosevelt. 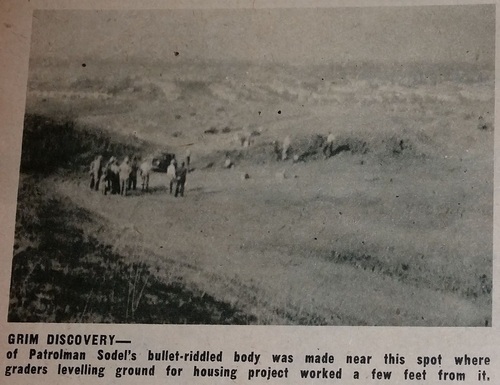 The murder had some similarities to Sodel’s murder. 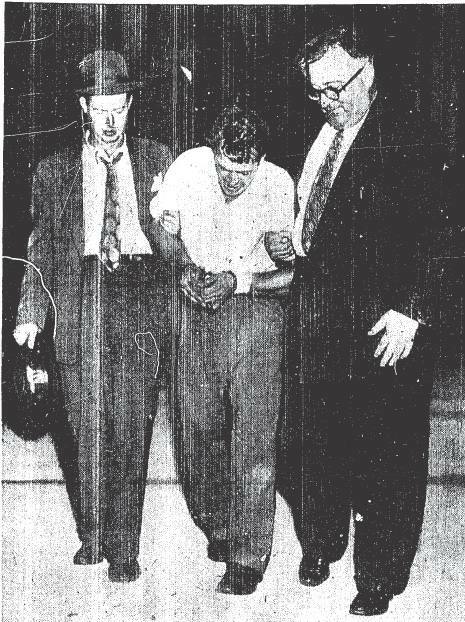 It wasn’t until six months later that Roosevelt’s real killer, Erwin ‘Machine Gun’ Walker, was apprehended. Walker was tried, convicted and sentenced to life in prison. Due to some legal twists and turns Walker was released on parole in 1974. He legally changed his name, became employed as a chemist, and vanished from public view. He died in 1982 without ever showing remorse for the cold-blooded murder of Officer Roosevelt. When Adams arrived at Union Station downtown he was immediately shackled to the aptly named Lieutenant John Law of the Sheriff’s Department. Adams told detectives that he had run across the country in a panic after he came to from black-out drunk episode to find Sodel’s patrolman’s cap and service weapon in his hands. The story was likely a pathetic attempt by the suspect to lessen his responsibility. And, in my opinion, his tale of being too drunk to recall the murder further unraveled when he managed to remember enough about the immediate aftermath of the crime to direct a car full of deputies to a vacant lot in which they found a charred fragment of the plaid seat cover from the stolen black Chevy sedan. The deputies drove Adams around until they reached Alameda Street between Seventh and Third Streets. It was in that area, the suspect contended, that he had ditched the guns (his and Sodel’s). Unfortunately no trace of either weapon was found. For a dazed man Adams had managed to accomplish a lot. He’d successfully evaded arrest for weeks following the murder, and he had had the presence of mind to dispose of evidence in such a manner that detectives had been unable to locate it some of it. Imagine what he could do if he wasn’t in a daze. Next time: Will a jury believe Tony Adams? Note: Watch HE WALKED BY NIGHT, based on the Erwin ‘Machine Gun’ Walker case. It is one of my favorite films noir.